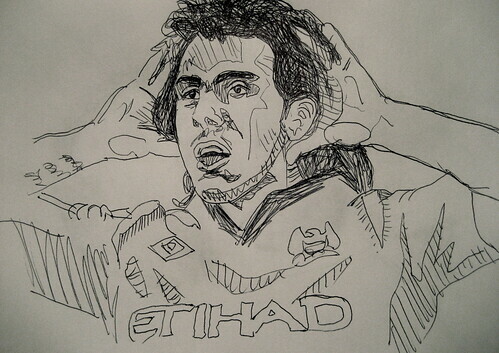 For you non-football fans, Carlos Tevez is an Argentinian footballer who currently plays for Manchester City in England. He has lived in the UK since September 2006, playing for West Ham and Manchester United before he joined their bitter city rivals. He has never seemed entirely settled in the country, and now his family are living back in Argentina, including his two daughters. He often talks about leaving to be closer to them. I couldn’t help but imagine what Tevez has been like in the classroom. What kind of learning experiences has he experienced up to this point that made him feel this way? Was it is his fault, did he have a bad attitude, or did the teaching he receive not match his particular requirements? My feeling is that (almost) everyone can be taught, no matter how difficult they seem, and it’s our responsibility as teachers to find the right style for our students. That’s not to say that it’s necessarily easy, of course. So my question to you is: If he was in your classroom, how would you teach Carlos Tevez? I have to say I would probably teach him in the same way as anyone else, especially since I'm not a football fan. That might be a good starting point: getting him to explain why he's passionate about football (I assume he is!) and using that to build on his language. You could also perhaps engage him on the differences between the UK and Argentina – here I would be more able to talk too, since I travelled in A. for a month a few years ago. As with all students, you try to find something that fires their passion, and work from there. I`m from Argentina and Carlos Tevez comes from a very very humble family. I am sure he had no formal English teaching education before he moved to the UK. He probably had a quite poor education in Spanish as well. I really sympathize with him because in spite of being such a successful football player, a celebrity in our country as well, he remains a humble, innocent person. He is not ashamed of his weaknesses and that is remarkable in my view. Didn`t answer your question but thought you might like to know this. @Sandy – I think it's really important we try and engage him, so I agree the focus of the lesson has got be on his interests, even more than usual. That's got to be a good start. @Vicky – Yes, his background is crucial in this. I know he's from a very rough neighbourhood in Boca (I didn't give too much biographical information because I didn't want to scare the non-football fans off!). So I too have a great deal of respect for him, for everything he has achieved. I guess my interest comes from the my perspective as an EFL teacher. This is very much an ESL problem, where you have a student from non academic background who is studying for purely practical reasons. I'm interested with how teachers cope with this, coupled with the fact that he's under even more pressure as a celebrity. I'm also from Argentina, and I've heard him in a recent interview, in which he said his teacher insisted on “the verbs”. I don't want to criticise anyone, but I partly agree with him because many times we teachers insist on teaching grammar as the only important thing, and forget that our learners need to “communicate”. I agree with you, Sandy: engaging him through his interests and building, so to speak, from there. @Veronica – I agree that the teacher would need to treat him in a different way to most students. I think you'd have to very carefully consider the content, as Sandy said, and your whole approach to the subject. I think any kind of explicit grammar teaching would be a bad idea. dogme + personalisation + get out and find where he needs/uses the language = learning? That would be my shot at it. @Mike – Thanks. You make it sound so easy! So I guess you'd get him to talk about the match at the weekend? I think that kind of small talk would be really useful for him, what with the post match interviews. And perhaps a discussion of the tactics too, so he can interact with his teammates and manager? Maybe you do need to be a football fan to teach him! The first thing that I would do is draw his attention to the amount of language that he has already acquired. His tweet clearly shows that he has at least a decent command of the language. I would also find out exactly where he feels he has the most problems. Is it doing interviews or daily activities? I think a healthy dose of role playing and other exercises designed to boost his listening skills would be beneficial. Simple but not easy, in the words of Candy van Olst! Being a football fan would help, but I'm sure you could also usefully talk about life in both countries, as Sandy mentioned above. In fact, you could be a football sceptic and ask him to convince you that it's worth watching! @Jason – Some great ideas there, but don't be deceived by the tweet, I think that's translated from a interview in Spanish. My feeling is that he's quite insecure with the language (something I can identify with), so confidence building is key. @Mike – I know it's easy, but you made it sound that way! I taught literacy to teenagers on training schemes before I did my CELTA, and many of the native English speakers I taught back then felt pretty much the same about their reading and writing skills. With students like this, you need to establish what has turned them off the subject and find a powerful hook to draw them back in. Students who have not experienced much in the way of formal learning, or who lack confidence in their ability to learn need to be given the option to learn the language informally in a relaxed, conversational way. It takes a lot of pressure off students if they don't have to worry about sitting an exam at the end of the course. I actually thing being a non-football fan might be an advantage if you were prepared to listen to him talking about it. That way he has an area of knowledge that is much higher than the teacher's and he can feel like he is teaching too. That might put him on more of an equal footing. @Sue – Thanks for your comments, your insight is really interesting. I think the lack of exam must be really helpful. I'm not very keen on them in the best of times, so in this kind of situation I actually think it could be damaging to their learning. @Sandy – As a professional footballer he would have higher level of knowledge about the game than 99% of the fans, trust me. But seriously, I think it would be very useful to make him feel like an expert in an cerebral way, as opposed to the way he is normally praised, in a physical way. Would do wonders for his confidence, I think. I've recently watched an interview with Carlos Tevez and when he was asked about his English, I had the impression that he felt very frustrated at his limited ability to communicate in this language. If I were his teacher, I would work on his communication skills and would let him choose the topics (he'll definitely choose soccer but may also want to talk about his daughters, his friends or Piola Vago band). We all know that difficulty communicating can cause great frustration. This i why I believe that helping him feel a sense of accomplishment is the key to encouraging him to learn English. After reading this I watched a few interviews on Youtube. Carlos Tevez' modesty really shines through! He obviously understands far more than he can speak. The phrase he repeats most often, like a mantra, is “very difficult”. Yikes!! If I were the lucky one to teach him, I would incorporate stress busters NLP activities as laid out by Jane Revell and Sue Norman http://tinyurl.com/3pjodve and empower him to produce manageable, everyday phrases. And have a little sympathy. Footballers have one tough job!